The UN special envoy to Syria has welcomed Russia's proposal of a 48-hour pause in fighting in the city of Aleppo to allow aid deliveries. Staffan de Mistura told the BBC the move was positive, but stressed that Russia would now have to get its ally President Bashar al-Assad to agree. The US also had to persuade the rebels to abide by the truce, he said. The initiative came as photos of a young boy from Aleppo who was hurt in an air strike caused worldwide outrage. Five-year-old Omran Daqneesh was photographed sitting alone in an ambulance, caked in dust and blood and looking dazed, after being pulled from the rubble of his home in the rebel-held Qaterji district. Media captionWatch: The footage shows Omran in the back of an ambulance. The surgeon who treated him tells the BBC about his condition. A doctor who treated the boy for a head wound said he was lucky to be alive. "He was afraid, he didn't cry and we cleaned his face blood and dust to see the wound. He has a lucky chance he didn't have any brain damage," Dr Mohammed told the BBC. 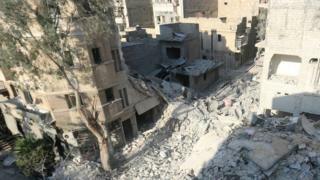 Opposition activists said the boy's home was bombed by Russian warplanes, but the Russian defence ministry insisted its forces never targeted civilian areas and said it was "more likely a mine or a gas tank explosion, which are used by terrorists". BBC chief international correspondent Lyse Doucet says stories like Omran's are repeated day in, day out in Syria, and many are much worse. On Friday, doctors shared a photo they said showed the body of boy who was killed in a fresh air strike, as well as a brother and sister who were injured. Aleppo, once Syria's commercial and industrial centre, has been divided roughly in two since 2012, with the government controlling the west and rebels the east. Fighting has escalated in recent weeks, with rebels severing the government's main route to the west of the city. The offensive sought to break a siege by pro-government forces, who encircled the east in July and stepped up air strikes. Russia's offer of a 48-hour "humanitarian pause" in the city came hours after a rare display of anger by the UN envoy, our correspondent says. For months, Mr de Mistura has urged the warring parties to agree even a temporary truce to allow food and medicine to reach Syrians trapped in besieged areas, some two million of them inside Aleppo. But on Thursday, he revealed that not a single aid convoy has been allowed through since the start of August and asked for a "gesture of humanity". Russia responded by saying that deliveries of food and medicine to Aleppo could start as early as next week, but that it required security guarantees from the US. "We welcome the reply because it was a clear reply to answer to our strong, reiterated appeal. So it's a positive reply," Mr de Mistura told the BBC. "Now, of course, the devil is in the detail but that's where the challenge is." A US state department spokesman said any effort to stop the bombing was welcome, but that a nationwide cessation of hostilities was what was really needed. Our correspondent says it will take far more than an envoy's anger and a child's distress to bring this war to an end. But there is now, at the very least, another effort to ease the suffering of millions of Syrians, she adds.